DeBuys, Churchill and Labouisse. Diboll, Owen and Goldstein. Favrot and Livaudais. Francis MacDonnell. Toledano and Wogan. A. D. Ballard. A. D. Danziger. J. J. Jacobson. W. Scott Bryan. S. G. Gainsburgh. R. H. Holmes. Sol M. Kahn. Casa Grande Apartments. 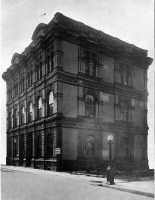 Hoehn Building. Mueller Building. Dr. Isidore Dyer. Samuel W. Weis. Herbert P. Johnson. H. Jordan MacKenzie. Mrs. R. S. Bayhi. H. P. Johnson. H. Jordan MacKenzie. E. A. Pilsbury. Equipping Baronne St. quarters to house library, stelier, etc. New Orleans Civic Improvement & Outdoor Art Assn. W. R. Burk. Walter F. Jahncke. Favrot and Livaudais. Emile Weil. New Orleans Railway & Light Co.
Building; competitive designs; bid accepted; drawing of plan. Bidding opened for construction of passenger depot on Canal St.
DeBuys, Churchill and Labouisse. Andry and Bendernagel. Emile Weil. Plans to beautify Esplanade Ave.
Audubon Park. City Park. Lafayette Square. Jackson Square. West End Park. Hutcheson Nurses Home. Milliken Hospital for Children. S. T. Alcus and Co. Illinois Central Railroad.